The notices set the tone for the production, which is comic and gruesome at the same time. Hovering above the stage is a metal circle. Could this symbolise the crown (the golden round) that Macbeth coverts and is to be at the heart of his downfall? Lucy Bailey has the ability to surprise in her approach to using the Globe space. I really liked the way the ravens descended from the netting in her production of Timon of Athens a couple of years ago. In that production the focus was on greed. For her production of Macbeth, Bailey has created a kind of hell, and the emphasis is on the ground and the under stage areas. 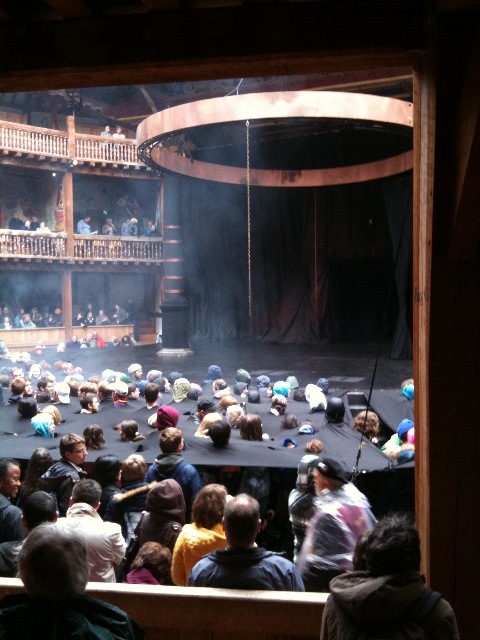 The groundlings are covered with a black sheet with slits for their heads to poke through. The effect is of decapitated heads floating above the sheet. Those under the sheet squeal and howl as the actors move through them. This business can be alluring, as well as distracting, as the audience find themselves watching groundlings rather than the performance. Smoke appears and pipes playing signal the start of the production. The witches taunt the audience, and bloodied heads appear and one of these is revealed to be the captain. Like Lucy Bailey’s RSC Julius Caesar this production attempts to show death in its most brutal form such as the crack we hear when Cawdor is put to death and his neck broken. Dead bodies are swallowed by the earth as they are dumped down traps. There’s lots of blood, as we would expect from Lucy Bailey who makes us focus on the visceral, as well as the intellectual ideas. For example, Macbeth’s hands are covered in blood after the murder of Duncan and this is echoed in the black sheets which are shrouding the Globe pillars are tinged in red as if stained with the blood of the king. The corpse of Duncan is brought on stage like a child, but it is also like a piece of meat. The theme of the body as meat continues throughout the play as Banquo’s ghost appears out of the raw meat banquet in the banquet scene. Macbeth has blood on his hands from handling the bloodied meat, but we also see this as Banquo’s blood. It feels like the physical images are reflective of Macbeth’s psychological trauma. This production oscillates between comedy and the macabre. This is partly achieved through the witches being on stage for most of the play, and their costumes echo that of the Globe ushers, as if they are directing the players through the play. The witches are on stage during Lady Macbeth’s soliloquy, and hand the dagger to Macbeth during his ‘Is this a dagger’ soliloquy. The grotesque porter haunts the production and, like the witches, is ever-present. In the closing scenes, Macbeth is alone with this man, and at the end of the play the porter is pushed to the floor which seemed to signal the end of Macbeth’s power. The witches grasp Macbeth and he is finally theirs.